This is for Antique Mommy, I told her I had a dragonfly picture that I had to dig out... and now that we have a new computer it was much easier! Well it's been almost an entire year before you put this photo up - but worth the wait! It's lovely! Wonderful photo. 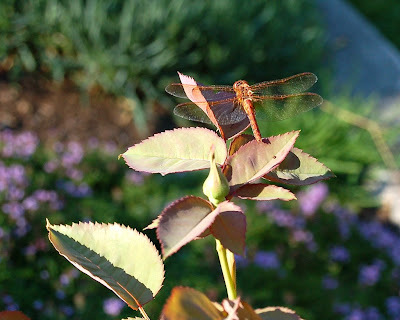 I can't believe you got close enough to get the picture without the dragonfly flying away! Wow! That is a beautiful photo. Impressive picture! I'm enjoying keeping up with your life via your blog. Thanks a bunch for including me.